- M. Fujii (Kurashiki, Okayama, Japan), 2015 Sep. 27.487 UT (reported by K. Ayani (Bisei Astronomical Observatory) via CBET 4145); spectrogram posted at: http://otobs.sakura.ne.jp/FBO/fko/nova/pnv_j18033275-2816054.htm. - O. Garde (Chabons, France), echelle spectra on 2015 Sep. 29.768 UT (via CBET 4145); spectrogram posted at: http://www.spectro-aras.com/forum/viewtopic.php?f=5&t=1264. - S. C. Williams et al. (Liverpool John Moores University), 2015 Sep. 27.84 UT (ATel #8101, http://www.astronomerstelegram.org/?read=8101). Charts: Charts for Nova Sgr 2015 No. 3 may be created using the AAVSO Variable Star Plotter (VSP) at http://www.aavso.org/vsp. Be sure to include spaces in the name as shown. Submit observations: Please submit observations to the AAVSO International Database using the name NOVA SGR 2015 NO. 3. Be sure to include spaces in name as shown. Once a GCVS name has been assigned, please use that name. 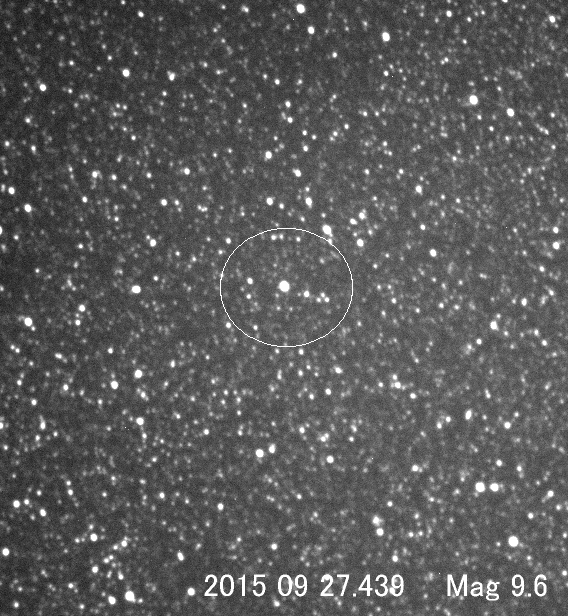 b. Y. Nakamura reports nothing was visible down to 12.5 at this location on two frames taken on 2015 Sep. 23.4205 UT. Several observers confirmed the nova visually or with an image, including Kaufman, Pearce, Camilleri, Bortle, and Guido (see above for locations). c. P. Schmeer (Bischmisheim, Germany) notes USNO-B1.0 0617-0684734 is magnitude B1=21.03, I=14.04 at position end figures 13.58s, 13.7". - K. Itagaki (Teppo-cho, Yamagata, Japan), 2015 Sep. 27.429 UT, 32.75s, 05.4". - K. Nishiyama (Kurume, Japan), 2015 Sep. 27.44093 UT, 32.74s, 05.6" (nearest star in VizieR has position end figures 32.70s, 05.7’, distance 0.54", V=20.491, I=19.115). 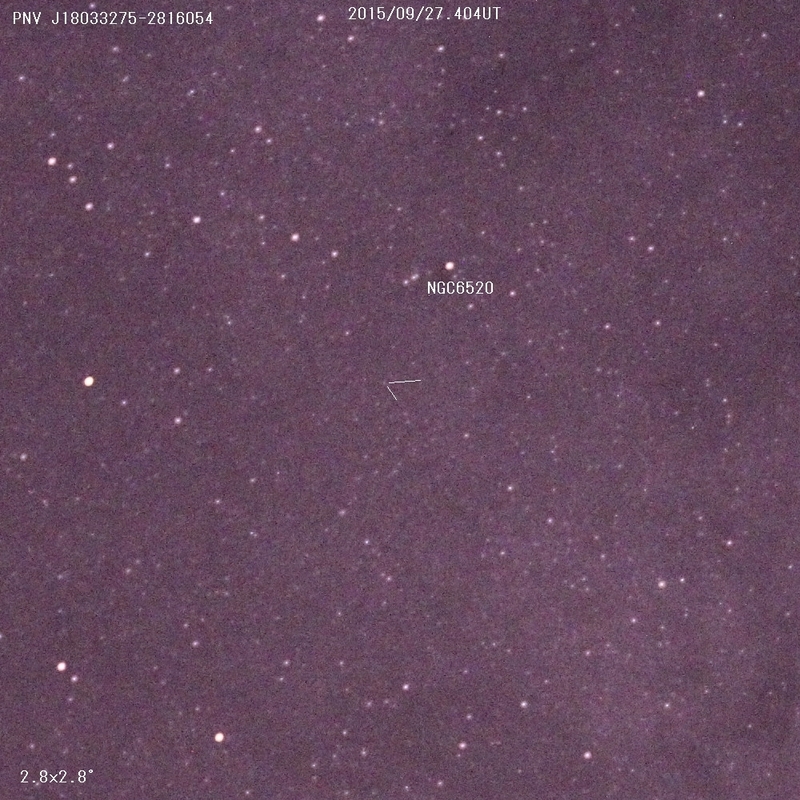 - A. Takao (Kitakyushu, Japan), independent discovery image, 2015 Sep. 27.447 UT, 33.6s, 10". - T. Noguchi (Chiba-ken, Japan), 2015 Sep. 27.483, communicated by S. Nakano, 32.75s, 05.4". - E. Guido, remotely using 0.43-m f/6.8 astrograph + CCD from MPC Code Q62 (iTelescope.Observatory, Siding Spring)), 2015 Sep. 28.4, 32.77s, 05.3". Congratulations to Koichi Itagaki, Akira Takao, and Yuji Nakamura on their independent discoveries!